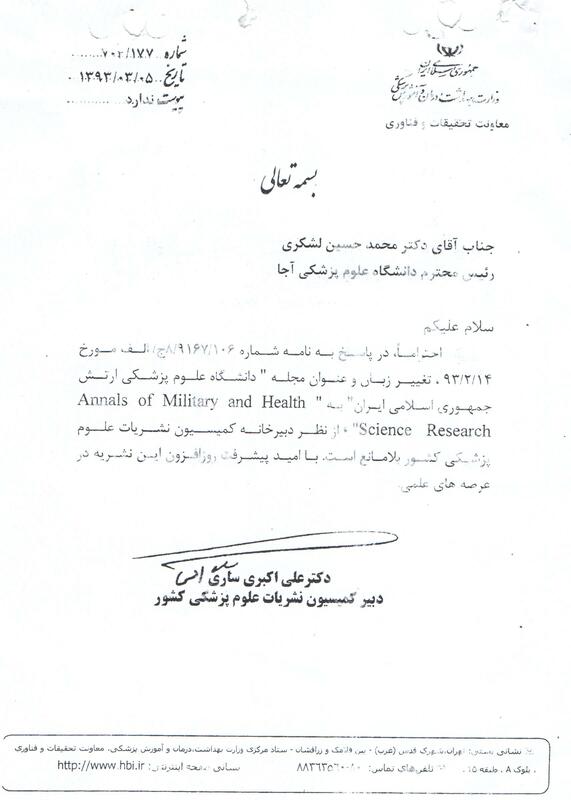 Annals of Military and Health Sciences Research ( AMHSR) is a peer-reviewed middle-eastern medical journal publishing in all clinical and theoretical aspects of medicine.scientific reports of original research in such areas as medical economic policy, medical ethics, and managing healthcare systems are also considered for publication. AMHSR is published quarterly and is the official journal of Aja University of Medical Sciences. Its content include original research, brief communication, expert and systematic reviews, case reports,case series, letter to editor, and technical innovation with the aim of promoting new advances in the field and enhancing standards of professional practice. Also, reviews of newly published books and articles are welcomed. In addition, historical articles which discuss the remarkable history of medicine all over the world, especially the Persian and Egyptian medicine, are of special merit. The AMHSR welcomes basic as well as clinical science articles. Scientific reports of original research in such areas as medical economic policy, medical ethics, and managing health care systems are also considered for publication.